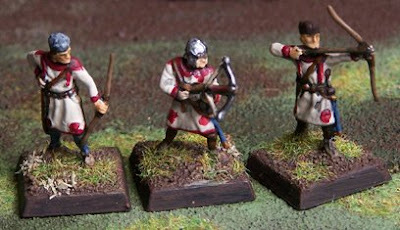 I finally finished my Song of Blades and Heroes / Song of Arthur and Merlin Romano-British warband. It's made up of all 1/72 models by Hat. They're mounted on plastic slotta bases. 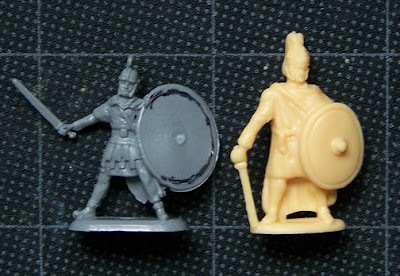 The above warriors are from Hat's Late Roman Medium Infantry, plus one armored model from the Heavy Infantry box. 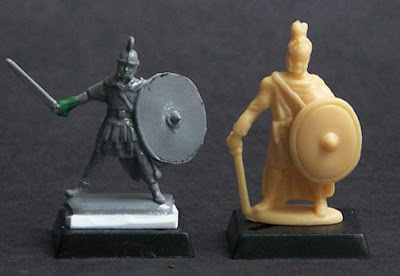 Three guys from the Late Roman Missile Troops box. 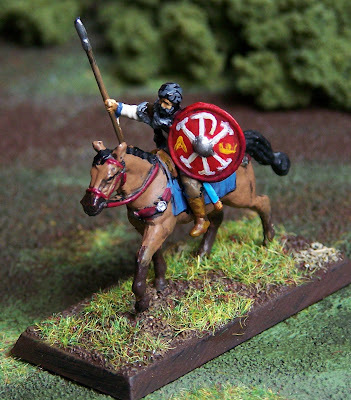 The above British noble is a slightly modified Hat Gothic Cavalryman. I added putty to the cloak edges for fur trim, and covered his knees to turn his odd shorts into full trousers. 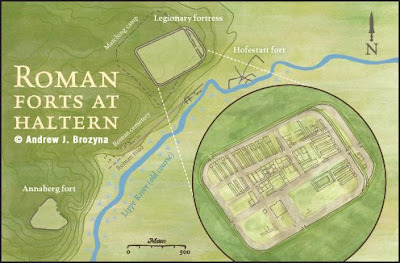 Hat has some armored Late Roman cavalrymen in the works, but it will be a while before they are available. That's only 12 models! Now, that's an army I can actually finish painting! 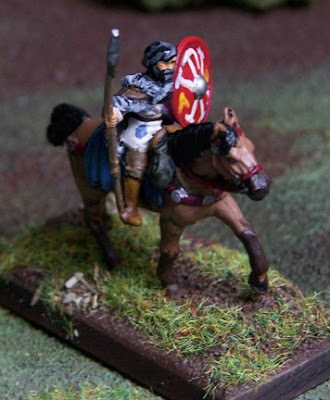 I may make the mounted figure a Romano-British king to get the Leader status, in which case I'll just drop one of the warriors. 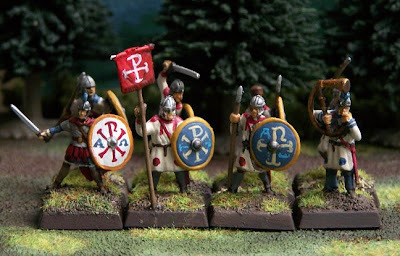 Next up, the Saxons. That warband will be only 8 models! Have you seen the online short film, The Hunt of Gollum? It's brilliant. It was a fan-made piece, but obviously they have alot of funding and skill. I had trouble with the volume, but I solved that by listening with headphones. After watching I was inspired to paint a couple models I have had for a while. 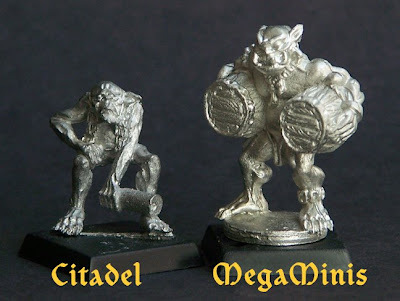 On the left is one of the adventurers from Vendel Miniatures (now sold by SGMM). 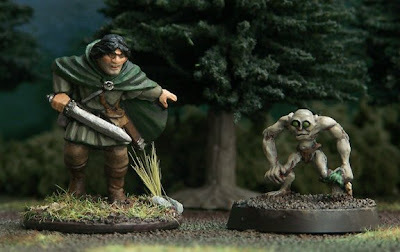 On the right is a Gollum model from Black Tree Design's Legends of the Realm range. The model originally carried a hare, but I remodeled it to be a fish (click on the left image for a larger version). What do you think? You can see a bit of my fingerprint in the putty rock, but apart from that I like how it all turned out. 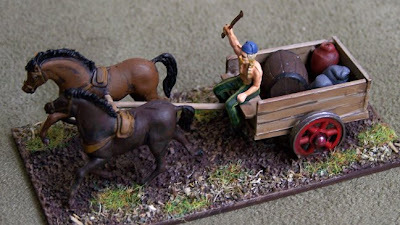 I gave my Muster the Minis coeval project another try, and doubled the participants (previously, it was just me)! This time around my friend, Jasper, joined in. The theme was artillery. 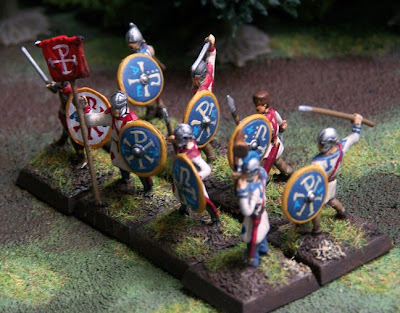 I painted the above models from Hat's 1/72 Late Roman Missile troops. This scorpion is almost the same model as appeared in their older Roman Catapults box. The new set offers a choice of pieces for the forward torsion frame. I glued on the open metal frame. 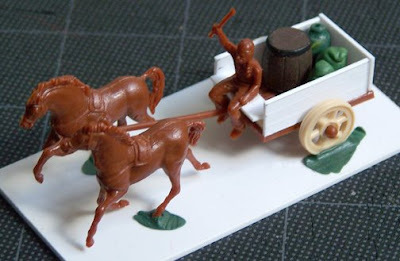 The other option is the wooden box-like frame from the original Hat catapult. I based these guys on plastic slotta bases to give them greater presence on the table (compared to the thinner sheet styrene I've been using). 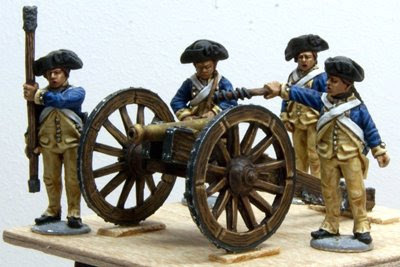 Jasper over at Ferret's Attention Span painted a nice set of the Perry Miniatures War of Independence Continental Army cannon and crew. Click over to his blog to see all the pictures. Japser's paint technique is to prime in white, then paint with a wash. This style has caught my interest as of late. I like how the paint pools in the recesses, naturally creating a shading effect. I'll have to give it a go sometime. I've been thinking about putting together some new 1/72 scale DBA armies, so I thought I'd bring out an old one from my closet. This is my II/11 Gallic army. It's the sole opponent to my Marian Roman army. I'm rather inexperienced playing DBA, but it seems like this match-up is too even. 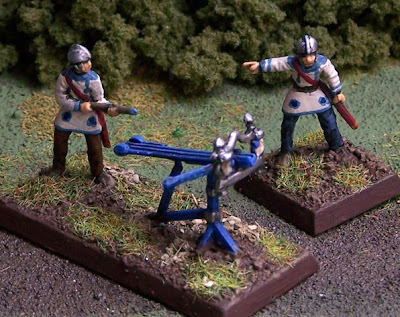 The few time I played these two armies it took forever to get a result—the Warband vs. Blades elements repeatedly pushed each other back, rather than making a decisive kill. I probably just need to learn some better tactics! Hat Celtic cavalry with one round shield converted to a hexagonal body shield. It's not my best paint work. The models are coated in Elmer's Glue (white PVA glue) to prevent chipping. It works great, but it's a bit shiny (I now use Windosr & Newton's acrylic Matte Varnish). The army was painted in 2001 or thereabouts. I almost want to do the whole thing over again! 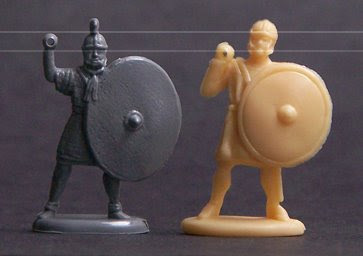 There have been a number of new 1/72 Hat Celtic releases since then, so it would be nice to include these. And I would like to have an army painted to my current standards. 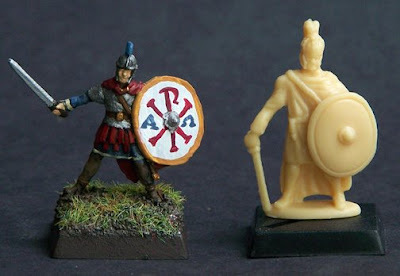 Maybe I'll do the Ancient British (same models, but a different army) and imperial Romans.